of wading through endless company presentations hunting for the document or single slide you need. them-saving significant reading, editing and filter time. slides and source documents at your fingertips. no longer have to waste time on dozens of corporate websites shifting through hundreds of presentations. Busy executives, planners, strategists and opportunity seekers can now search a single database of the industry's presentations, find, analyze, save and collaborate on important oil and gas information previously hidden in the digital haystack. Our classification categories have been designed to provide clients with maximum control over their document searches with minimum hassle. 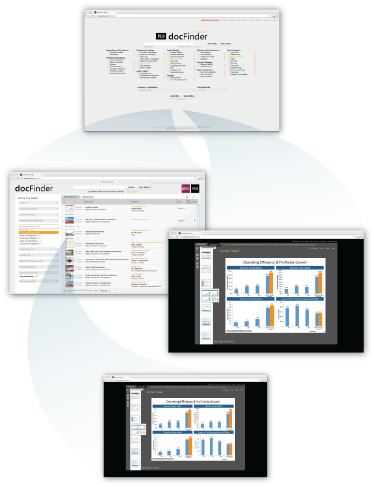 The system combines "control" with PLS' unique image and free-text search capability creating a unique and powerful industry database. not indexed by traditional search engines. Looking for a bar chart comparing a peer or competitor's finding and development costs? Type, click and view. Looking for metrics and comparables on regional M&A transactions? Type, click and view. Looking for every slide in the Haynesville with a log image? Type, click and view. Looking for slides with maps by operators or areas? Type, click and view. Finally, looking for a type curve in the Eagle Ford? It's there and docFinder will take you to the right slide in seconds. Please contact us to discuss your project or venture.